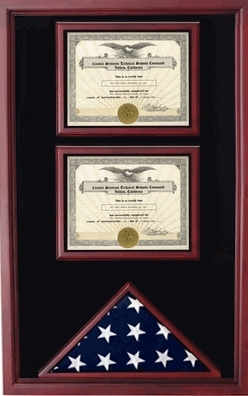 Our 2 Documents or 2 Award Display Flag Case will be able to showcase your military Documents and awards along with an American Flag. Our case can be made out of Cherry or Oak wood, and will have a museum quality Plexiglass to protect your flag and Documents from any sun damage. The Military 2 Documents and Flag display Case is an exact duplication for a case that we have created on behalf of several Generals in the United States armed forces. The 2 Documents / or Award Flag Display Case is made out of the best wood available in the American Market. Flags presentation are a thing of honor and these is not an alien culture in the United States; in fact it is norm. Every year, more than sixty thousand flags and Documents are presented to honor military personnel and their family members for dedication to serving their country. And about four times the number presented to the military personnel are transported over to the Capitol building for the purpose of commemorating retirements from service, honor awards and special achievements. Flags and Documents of honor are an invaluable gift given to people who can be called patriots due to the parts they have played in serving their Father Land. It is a representation of the past, the present, and the future of the United States. They are a representation of honor to those who have been patriotic in their service to the Nation both in time of war and that of peace. Therefore such great and invaluable possession should be well preserved in beautiful and protective flag cases as we have here on this site. And what more is that these Flag cases, Documents and documents cases come with the most reasonable price ever that could be! And they are made in America too! It has a Plexiglas front and black lining for an elegant touch. Orders for the 2 Documents Flag Display Cases are usually shipped out within one business day to places within the USA and Canada.